We offer a total email marketing solution. Our expert email team works with you to develop a customized, well-designed and accurately coded email marketing campaign. The DatabaseUSA.com® email campaign management experts are happy to walk you through the process of cleaning your customer emails, creating an email design, linked content, deployment, and campaign analytics and statistics. From subject lines to mobile friendly/responsive design, DatabaseUSA.com® provides an all in one solution for your email marketing needs. Learn more about DatabaseUSA.com® Email Marketing Solutions. Email deliverability can be a bit daunting at times. With email filtering obstacles and federal regulations, email marketing can seem complicated. Click here for email deployment best practices, from creating a straight forward, not misleading subject line, avoiding using too many images (following the 80/20 rule), to making your email CAN-SPAM compliant. However, avoiding these obstacles may be easier then you thought. 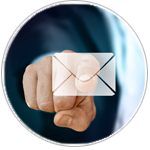 Our DatabaseUSA.com® email team can create and deploy your email campaign following the email deployment best practices. Click here to read more about Email Deployment Best Practices. Complete the form or call us at 877.407.0101 for more information on our Email Campaign Management and Email Creative services.